When John Colter's descriptions of Yellowstone were reported in the St. Louis newspapers in 1810, most readers dismissed them as tall tales. But 60 years later, the nation was convinced and in 1872 Yellowstone became a national park. After hiking in the nearby Beartooth Mountains, a friend and I drive through Yellowstone Park on our way to Jackson, Wyoming where we are to meet our Yellowstone tour group. We are greatly impressed with the northeast section along the Lamar River valley. Driving at dawn, we see moose, elk, coyote, bison. (The park seems to be filled with huge bison. The herds are immense.) An impressive cloud bank softly blankets the valleys. Yellowstone is 2,220,000 acres and is a Biosphere Reserve. It is also a World Heritage site. Old Faithful and 10,000 other geysers and hot springs are found in the park and make it the world's greatest geyser area. In 1872, it became the world's first national park. After meeting with our tour group (our tour is six days long and includes 12 others) in Jackson, we drive up to the Old Faithful Inn ( Old Faithful regularly erupts right next to our Inn) to see all the impressive and colorful geysers—much more interesting and impressive than I had expected. We then spend time at the Lake Yellowstone Lodge, which includes a hike up to Avalanche Peak—this trek affords incredible views of snow-capped peaks and valleys throughout Yellowstone (see photo at left). We also engage in a day hike along the Grand Canyon of the Yellowstone, a 24-mile long, 1,200-foot deep canyon, which I am awestruck by. 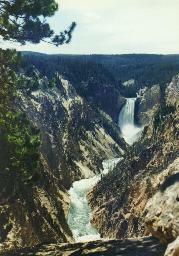 The cliffs and waterfalls are breathtaking (see photo of Yellowstone's Lower Falls—308 feet high—upper right of this page), as are the occasional glimpses of secluded marshes and lakes. Also breathtaking are the many fields filled with a riot of wildflower colors. Because we are so impressed by the wildlife at Yellowstone, my friend and I abandon our plans to hike and camp in Idaho (we had planned to explore the Sawtooth Forest, Craters of the Moon, Nez Perce, and Upper Mesa Falls). We drive back to Yellowstone from Jackson, and on the advice of one of our guides, camp overnight on a hilltop in the middle of a wildflower valley across from the Tetons (here we have a gorgeous sunrise view of the Tetons coming out of our tent the next morning). And there is not a soul anywhere near us at the site! The only minor problem was that a rainstorm has made the dirt road leading up to the site quite treacherous. It is so slick that I am sure we are going to end up in a ditch. Instead, we just end up with a rental car full of mud. On the final day of our vacation, after all the hiking is over and my feet were so full of blisters I could hardly walk, I do what I should have done from the beginning: I buy a pair of expensive hiking boots for half price in Bozeman. In any event, we are saved from a horrible, cruel death by a mistake made by the ranger: he had given us a backcountry permit for the trail and mistakenly has double-booked our camp site so that a group of student trail construction/maintenance people are at our site. They help us immensely in our miserably cold and wet state by providing us with shelter and a warm fire (it was in the 40s). Fortune is with us the next day, too, as the weather clears. We spot two moose along the way, one of which passes within 50 feet of us during the rain, and another which is in the middle of the river we are walking along. All in all, we hike about 30 miles in 2 days along this trail. One thing that is both interesting and disappointing about Yellowstone, by the way, is that the massive wildfires they had in 1988 are still extremely evident. It seems as if 75 percent of the Park (the Park is over 2 million acres in size) consists of dead lodgepole pines killed by the fire. Since the growing season is so slow here, the young seedlings are still only a few feet in size (unlike Florida, where trees grow back in what seems like a few years). 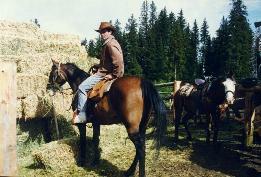 Next, we saddle up for a horseback ride (see photo below) in an area near the Grand Tetons. The Tetons are a striking sight. They are so stark—boldly…sharply jutting skyward (photo at left). Also on that day we saddle up on iron horses for a bike ride along a dirt road in a secluded area and are lucky to see beautiful white trumpeter swans in a lake at our lunch stop. 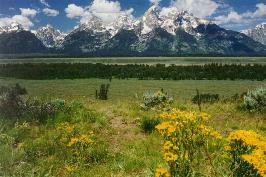 The Tetons consist of 310,000 acres. Established in 1929. It was expanded to its present size when the Rockefeller family donated land that it owned in Jackson Hole. They rise more than a mile above the sagebrush flats. Contains a part of the winter feeding ground of America's largest elk herd. The guided tour concludes with a wild bike ride down a road with a long descent (an abandoned road through a wooded area, followed by a ride along a narrow path in the woods and wildflower meadows). And the grand finale is an exciting rampage down the Snake River (a whitewater rafting trip). The tour company is Roads Less Traveled. We then drive to Missoula for a few days of recovery. A superlative city. Strong outdoors orientation by the residents (never before have I seen so many fishermen, although there are plenty of hikers, kayakers, and bicyclists). Clean, crisp air. 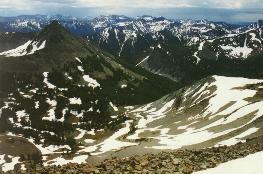 Plenty of great mountains and other wild areas nearby. Impressive downtown filled with maple-shaded residential streets, Victorian homes, a university campus nearby, good greenway trails along the downtown river, neat restaurants and used bookstores, progressive and environment-minded citizen activism, supermarkets filled with natural foods and locally-brewed beers, a downtown farmers market, and great downtown sculpture. I have since placed Missoula in my top 5 of all-time favorite cities (Bozeman is 9th).